On Earth Day 2018, people from all walks of life and all neighborhoods came together for a one of a kind experience celebrating art, music and community. 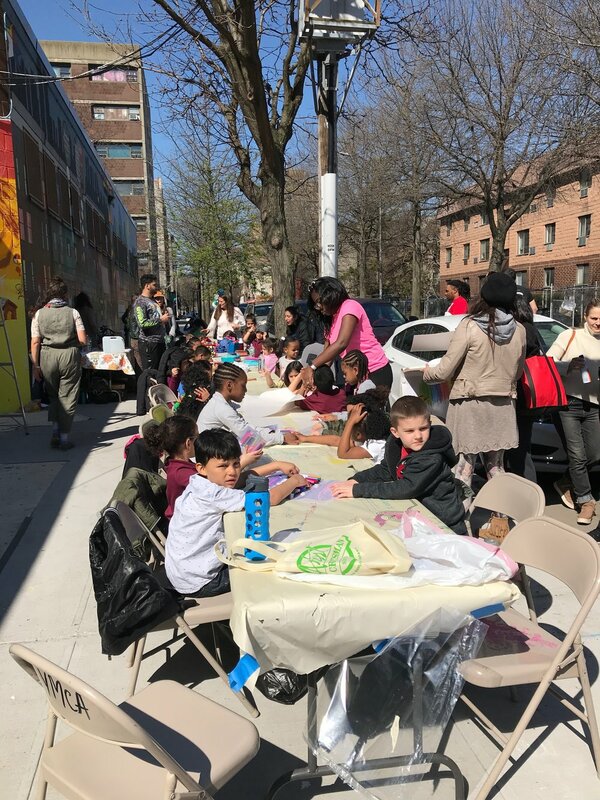 In collaboration with Artolution, an organization that facilitates community-based public art projects, the Sacred Arts Research Foundation set up shop at 125 Humboldt Street in Bushwick to facilitate the painting of a large scale public mural. We couldn’t think of a better way to honor the earth than by creating a community driven experience filled with wonderful music, good food and, above all, art making! 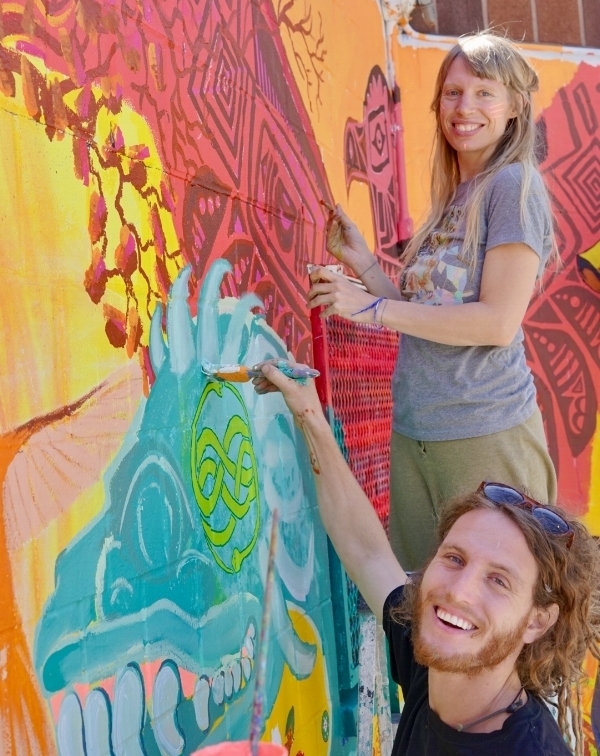 Over 300 people were able to contribute to the mural, 200 of which were students ages 6-12. The project enjoyed participation from 5 local public schools, the Compass after school program, a local homeless shelter, and a women’s rehabilitation program from Manhattan. Many people were simply passing by when they decided to stop and participate in the project. Additionally, people made the trek from the outer boroughs and New Jersey, and we had a great turn out from friends of the Sacred Arts Research Foundation and Golden Drum community. We began the process with a collective brainstorming session to combine ideas and themes in honor of Earth Day. We looked though pictures of indigenous tribes such as Shipibo people of the Amazon, Taino people of the Caribbean, as well as other projects that Artolution had previously completed for inspiration and direction. Once we had an idea of our central theme, everyone sat down to first draw out their own unique vision on paper. From there we used chalk to outline our ideas on the wall and from there we picked up our paint brushes and went to work! It was a safe and supportive atmosphere where every idea was embraced and somehow everything fit into what turned out to be a miraculous piece of art. Whether or not you were a kid, an adult, an experienced artist or someone who didn’t think they could paint at all, the atmosphere at the mural encouraged everyone to pick up a paintbrush, express and explore. We were accompanied by incredible live musicians, wonderful food, and countless volunteers that really made the project unfold seamlessly. We are grateful to everyone who traveled near and far to make this event a huge success as well as to all of the local businesses that made a donation to the project. Because of your efforts, one corner of this world is a little bit brighter, filled with allot more color and many magical memories of a very harmonious and creative Earth Day. Sacred Arts Research Foundation would like to give Special thanks to our presenting partners: Golden Drum, Eastern District YMCA, Colibri Community, and Artolution and our sponsors: Food Bazaar, Bravo Supermarket, 4 Seasons Paint Store, Artist & Craftsman Supply and Jungle Cafe. We would also like to extend our deep gratitude to Maestro Manuel Rufino, founder of Sacred Arts Research Foundation, for receiving and conceiving the vision to celebrate the indigenous and native cultures from around the world through the Earth Day Mural Project.